Polish rabbi; died in Lemberg on April 28, 1560; the first known rabbi of that community and one of the earliest great rabbis of Poland. 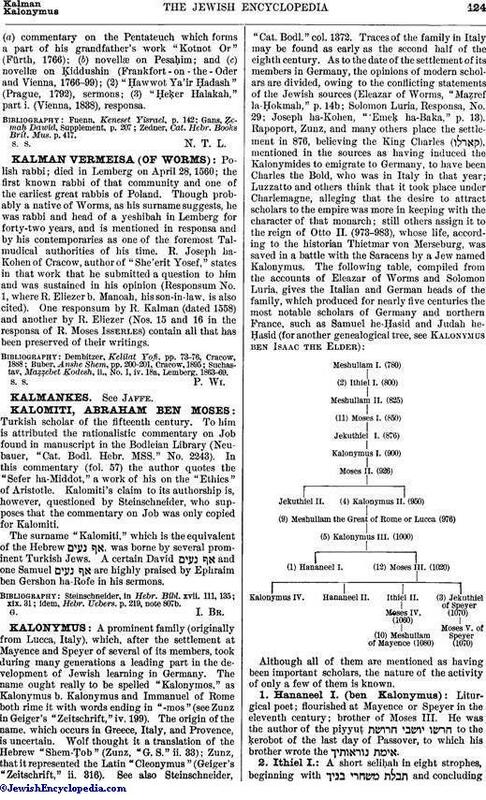 Though probably a native of Worms, as his surname suggests, he was rabbi and head of a yeshibah in Lemberg for forty-two years, and is mentioned in responsa and by his contemporaries as one of the foremost Talmudical authorities of his time. R. Joseph ha-Kohen of Cracow, author of "She'erit Yosef," states in that work that he submitted a question to him and was sustained in his opinion (Responsum No. 1, where R. Eliezer b. Manoah, his son-in-law, is also cited). One responsum by R. Kalman (dated 1558) and another by R. Eliezer (Nos. 15 and 16 in the responsa of R. Moses Isserles) contain all that has been preserved of their writings. Suchastav, Maẓẓebet. Ḳodesh, ii., No. 1, iv. 18a, Lemberg, 1863-69.